If you wish you could bring the community vibes and the conveniences of college dorm living to your studio apartment, you’ll love WeWork’s new co-living apartments of the future. 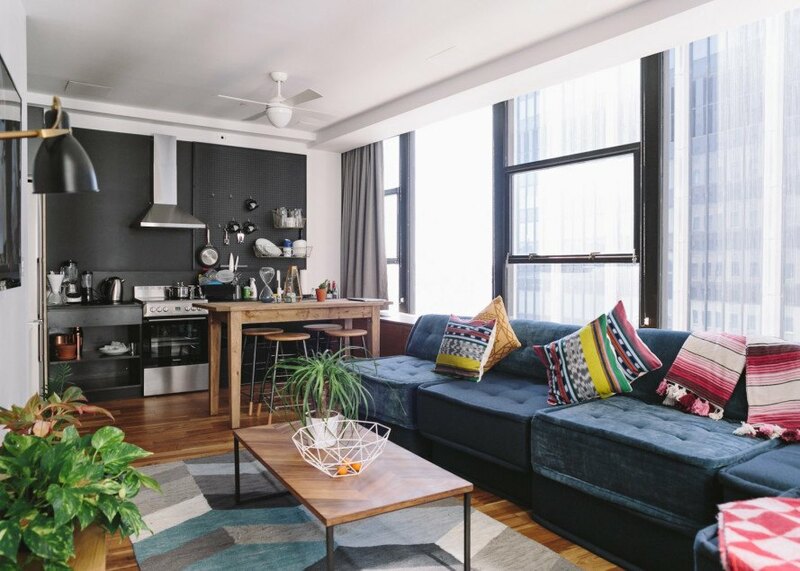 The multibillion-dollar co-working company just opened the doors to WeLive, its inaugural co-living micro-apartment space in New York City, this week. Available for rent with convenient month-to-month flexibility, these gorgeous fully furnished dorm-style apartments challenge traditional apartment living by using design and technology to foster a new sense of community. Like the WeWork offices, the WeLive apartments are beautifully furnished, offering Instagram-worthy angles in every room. Unsurprisingly, the business model is targeted at millennials, but WeLive spaces welcome anyone from those fresh out of university to freelancers wanting a more social space to come home to. Renters have the freedom to sign a month-to-month agreement or a yearly lease. Located at 110 Wall Street in a former office building, the newly opened WeLive apartments share a building with WeWork, which occupies four floors. There are currently only 200 units available, but plans are in place to convert the remaining 20 floors into 600 fully furnished micro-apartments divided into “neighborhoods” that share communal spaces. Living options range from one-bedroom studios to shared four-bedroom units that sleep up to eight, and prices start at $1,375 per person in a shared unit while individual studios start at $2,000. A $125 monthly fee covers amenities such as high-speed Internet. Creative space-saving design was crucial to the success of the WeLive micro-apartments, which are about 450 square feet on average. Transforming furniture, such as the folding coffee tables and studio apartment Murphy beds, allow for versatility and maximization of storage space. The spatial layout is also designed to encourage social interaction with strategically placed sitting areas, numerous common areas, and amenities such as the pool table placed in the laundry room. Tenants also have access to a full-time community concierge and housekeeping team as well as access to all We Community events through the WeLive mobile app. WeLive expects to finish the 600 micro-apartments in the 110 Wall Street building by next year. The company also has a second co-living location near Washington, D.C. at 2221 S. Clark Street in Arlington, Virginia. Please contact me for private efficiency availability beginning August 1, 2016. Like the WeWork offices, the WeLive apartments are beautifully furnished, offering Instagram-worthy angles in every room. Unsurprisingly, the business model is targeted at millennials, but the WeLive spaces welcome anyone from those fresh out of university to freelancers wanting a more social space to come home to. Located at 110 Wall Street in a former office building, the newly opened WeLive apartments share the same building with WeWork, which occupies four floors. There are currently only 200 units available, but plans are in place to convert the remaining 20 floors into 600 fully furnished micro-apartments divided into “neighborhoods” that share communal spaces. Living options range from one-bedroom studios to shared four-bedroom units that sleep up to eight, and prices start at $1,375 per person in a shared unit while individual studios start at $2,000. Creative space-saving design was crucial to the success of the WeLive micro-apartments, which are about 450 square feet on average. Transforming furniture, such as the folding coffee tables and studio apartment Murphy beds, allow for versatility and maximizing storage space. The spatial layout is also designed to encourage social interaction with strategically placed sitting areas, numerous common areas, and amenities such as the pool table placed in the laundry room. Tenants also have access to a full-time community concierge and housekeeping team as well as access to all We Community events through the WeLive mobile app. WeLive expects to finish the 600 micro-apartments in the 110 Wall Street building by next year. The company also has a second co-living location near Washington, D.C. at 2221 S. Clark Street in Arlington, Virginia.